VATICAN CITY (CNS) — One perk that comes with floating aboard the International Space Station is NASA arranges for occasional calls with celebrities to keep the astronauts’ spirits high during their monthslong flights. Before his first space mission began this year, Catholic astronaut Mark Vande Hei of Falls Church, Virginia, requested a call from Pope Francis, and Oct. 26 his wish upon a star came true. The pope linked up live from the Vatican with the six-man crew as they orbited 250 miles above Earth. “Good morning, good evening,” the pope told the crew at 3 p.m. Rome time “because when you are in space, you never know” what the real time is. During their 20-minute link-up, Pope Francis asked five questions about how their unique perspective from the frontier of the universe has changed or enriched them and what lessons they could share with people back on Earth. Saying society today is very individualistic, but what is needed is collaboration, the pope asked them how the ISS is an example of that collaboration. Flight engineer Joseph Acaba of Inglewood, California, said it is the diversity of each individual that makes the team stronger. “We need to embrace who we are as individuals and respect those around us, and by working together we can do things much greater than we could do as individuals,” he told the pope. Pope Francis said they were like a tiny United Nations, in which the whole was greater than the sum of its parts. Thanking them for their work, he said they were “representatives of the whole human family” working on such an important project in space. Bresnik, a Baptist, said, “People cannot come up here and see the indescribable beauty of our earth and not be touched in their souls.” His fellow crewmembers were also Christians: two Russian Orthodox and three Catholics. The commander said he hoped the beautiful images they capture from space and their example as international crewmembers successfully working together would be an inspiration and a model for the rest of the world. 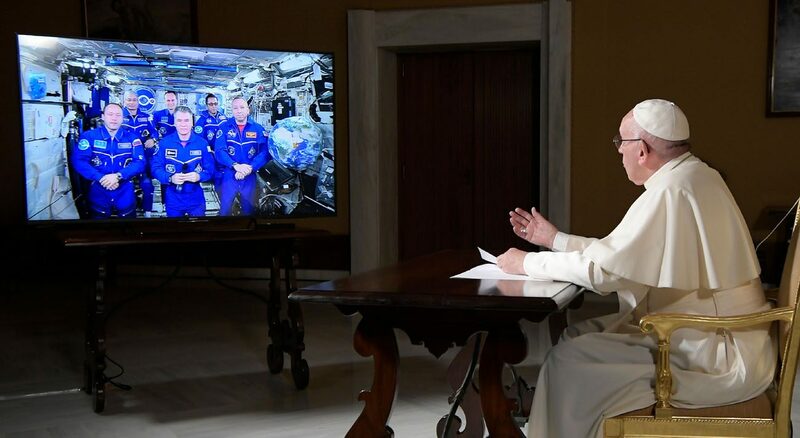 The pope said he was struck by Bresnik’s awareness of the fragility of the earth and humanity’s capacity to destroy it, but also the hope and inspiration the astronauts could feel. “This is truly human thing — the ability to decide,” the pope replied. When asked what made them want to become astronauts, Russian flight engineer Sergey Ryazanskiy said his grandfather was his biggest inspiration because he had been the chief engineer on the Soviet team that built Sputnik, the first artificial satellite successfully launched into earth’s orbit. “So for me, it is a great honor to continue what he was doing to fulfill his dreams,” said Ryazanskiy. After Pope Francis asked for their thoughts about Dante Alighieri’s verse in the Divine Comedy that love was the force that “moves the sun and the stars,” Russian flight engineer Alexander Misurkin said only love gives you the strength to give yourself for others. It was the second time a pope has called ISS crewmembers; Pope Benedict XVI spoke with 12 astronauts in 2011, praising them for their courage and commitment and for their comments on how science can contribute to the pursuit of peace and the protection of a fragile planet.